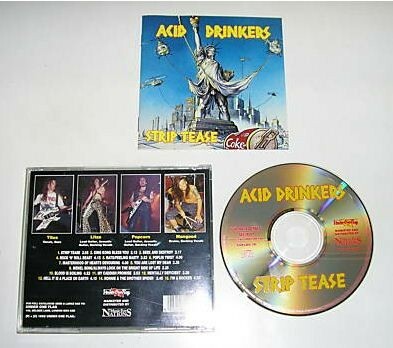 Strip Tease is the third album by a polish thrash metal band Acid Drinkers. It was recorded in Izabelin Studio near Warsaw. The album features fifteen tracks sung not only by Titus and Litza, but also Popcorn. It includes also two cover songs: the first one is an acoustic version of Metallica’s classic, Seek & Destroy. The second one is Alway’s Look on the Bright Side of Life, a remake of a song by Monty Python. This song was a result of bands watching of Life of Brian and at first was not planned to be recorded. It is said, that one more cover song was intended: a reggae version of Slayer’s Black Magic.